What followed were 82 blissful looks in gelato shades of mint green and sunshine yellow, mother-of-pearl white and pink – punctuated with black and navy, and cheerful parasol and seashell motifs, printed on chiffon. As ever, Lagerfeld found new ways to riff on the Chanel tweed suit, here cut with new volume – wide on the shoulder, flared at the sleeve – while a play on relaxed robes cabanes (“beach hut dresses”) came in luminously coloured tweed or lace ruffles; other gowns were twisted across with chest, as you might a beach towel. Accessories, meanwhile, had a distinctly 1990s flavour – logo-emblazoned hats, earrings, belts, and beachball-shaped bags recalled the maximalist Chanel campaigns of the supermodel-era, those with Linda Evangelista, Christy Turlington, Trish Goff et al. A sense of ease – at once suited to the Parisian streets or the golden sands of St. Barths – permeated throughout. Here are five things we learnt. The youthful visage of the Chanel woman is not retained through good will alone. Covering up in the midday sun is vital. 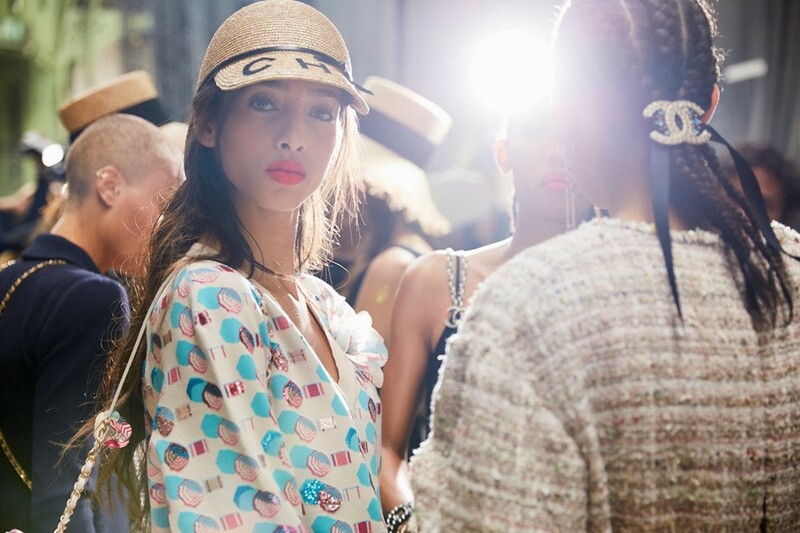 And what better way to do so than with a Chanel straw sunhat? If the style has become somewhat ubiquitous of late, leave it to Lagerfeld, alongside milliners Maison Michel, to perfect the style – here, either wide-brimmed and left raw at the eges, or as a visor, with ‘CHA’ on the front and ‘NEL’ at the back, making for 360-degree brand allegiance. If a simple beach bag was once all that was required for a day oceanside, Lagerfeld posited the necessity of a whole gamut of accessories – stacked lucite bangles, sautoir necklaces and generous strings of pearls all seemed to reject Coco Chanel’s oft-quoted guidance to look in the mirror and remove one accessory before one leaves the house. We would, though, advise removing the necklace which spells out ‘CHANEL’ before prolonged sun exposure, for want of branded tan lines – though, on second thoughts, would that be such a bad thing? What could possibly be better than a Chanel bag? Two – naturally. And, even better when those two are, in fact, one, as per this season’s “side bag” – two quilted Chanel bags made to hang on each side of your person, like bicycle panniers, held in place with criss-crossing chain straps across the chest. They leave the Chanel woman to go on as she should – entirely hands-free. Post-show, Lagerfeld remarked he was suprised – particularly noting his role at a house such as Chanel, which sells thousands of pairs of shoes each year – at how good his models looked sans footwear (they walked the show barefoot). Fans of the house’s footwear need not be alarmed, though – perfectly formed mules with a mid-sized plexiglass heel on a cork sole walked the runway, not on the model’s feet, but in their hands. Which, in itself made for a welcome new proposition for accessory-wearing (though is perhaps not recommended for grubby city sidewalks). Leather might not be go-to beach attire, but Lagerfeld made a renewed appeal – suiting, with a sportswear flourish, was cut from impossibly lightweight leather, in pale pink or navy contrast trim for graphic effect. Such was the house’s mastery of fabric that they looked an entirely practical proposition for sunny days – ditto for the tweed, in sugary hues and edged with Chantilly lace – or, at least, clothing worth sweating for.